Infant Swimming Resource's proprietary Self-Rescue™ survival swimming program is a 4 - 6 week course, scheduled 5 days per week, Monday through Friday, for not more than 10 minutes each day. With a focus on safe, customized one-on-one lessons by certified Instructors, ISR's survival swimming lessons emphasize health, ongoing student evaluations and parent education to deliver the most effective and safest results in the industry. Lessons for a 6 - 12 month old focus on teaching the child to roll onto their back to float, rest and breathe, and to be able to maintain this life-saving position until help arrives. Lessons for children 1 - 6 years old focus on teaching the swim-float-swim survival sequence. Children learn to swim, roll onto their back to float, rest and breathe, and flip back over to resume swimming until they reach the side of the pool where they can either crawl our or until they can be rescued. In compliance with HIPAA, all registrations are submitted online through my unique ISR Registration URL . To register with Infant Swimming Resource, parents must complete a detailed registration form for each child. The cost to register your child is $105 which is due upon completing the online registration. The weekly tuition rate is $100 per child. I offer a sibling discount (weekly) when siblings are in lessons at the same time. Arcadia Swim for Kids is centrally located in the Arcadia area of the Camelback corridor, near 44th Street and Camelback Road. To register for lessons, please call 602-952-8696, or email by clicking here. Infant Swimming Resource (ISR) is the result of over 45 years of research and development by Harvey Barnett, Ph.D. ISR's Self-Rescue™ program for aquatic survival and drowning prevention teaches infants and young children to float and swim. Since 1966, ISR has safely delivered over 8 million lessons teaching ISR Self-Rescue skills to more than 300,000 children. 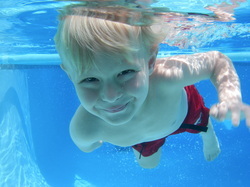 To date, ISR has more than 800 documented cases of children using ISR techniques to save themselves from drowning. Infant Swimming Resource LLC ("ISR") complies with all federal and state laws and regulations and does not unlawfully discriminate on the basis of race, color, national origin, gender, age, religion or disability. It is the policy of ISR to provide reasonable accomodations to its disabled applicants and students with the provision of appropriate documentation of the need for the accomodation.